From the studio that brought you Sleeping Beauty, The Jungle Book and other timeless animated classics comes Disney’s 101 Dalmatians on Blu-ray™, Digital HD, Disney Movies Anywhere, DVD and On-Demand February 10th! Exciting bonus features include a never-before-seen animated short, bonus clips and more! This is one of my all time favorite Disney movies EVER and I was super excited to receive a copy for review. It is the same story that we have grown to love, but now on Blu-Ray and Digital HD! The short included was a new short, “The Further Adventures of Thunderbolt” which even I enjoyed, but my nieces and nephews couldn’t believe Thunderbolt was back on the screen! Pick up your copy of this old favorite to add to your Disney collection! It is a must own movie!! Synopsis: Pick your favorite spot to watch—anytime and anywhere—and get ready for a fun-filled adventure with the Diamond Edition of 101 Dalmatians! Pongo, Perdita and their super-adorable puppies are in for thrills, hilarious spills and an epic action-packed adventure when they face off with Cruella De Vil, Disney’s most fabulously outrageous villainess. When Cruella dognaps all of the Dalmatian puppies in London, brave animal heroes launch a daring plan to save all puppies from Cruella’s clutches! Unleash all the excitement and suspense of Disney’s 101 Dalmatians, a beloved classic you’ll want to share with your family again and again! 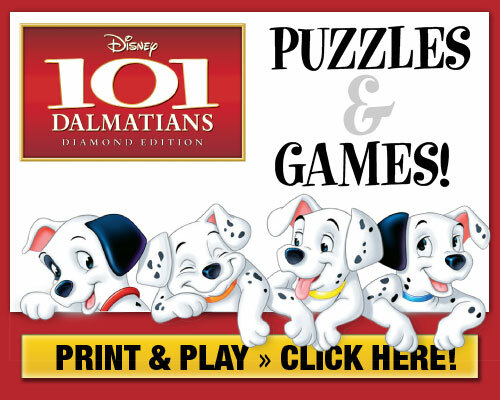 Stay connected with the latest news and information about ”101 Dalmatians”: on Facebook, and of course Disney’s website!